The talent of the Russian painter Fedor Petrovich Tolstoy is multifaceted. The master showed himself in painting, graphics, and sculpture. Especially popular are his incredibly elegant and concise still lifes. 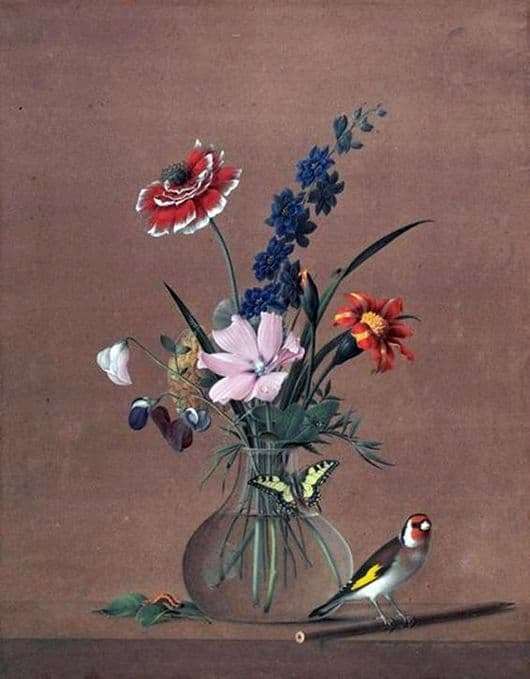 The most expressive picture is “A bouquet of flowers, a butterfly and a bird”. On a gray background of an unpainted wall we see a modest bouquet consisting of several plants. He was placed in a transparent glass jug so that all parts of the flowers from the stem to the petals were visible. There are no bright lush roses or dahlias. The bouquet is simple, simple in shape. But they express real natural beauty, not screaming, but modest. Figure as restrained. The author uses natural shades of dark green and bright spots highlights key details. In the middle in the foreground there was a pink with a blue bead in the middle of a cosme flower. Flower petals are traced so vividly that I want to touch them and feel the smooth cool surface and veined relief. To the left above all is a red poppy with a white rim, in the middle of which numerous stamens stick out. Below on the right is an orange marigold with a bright yellow core. He is depicted so naturally that you can feel his tart smell spreading around the room. Immediately here is a modest rich blue Levkova and plainly simple mouse polka dots. Next to the bouquet, the master draws representatives of the fauna: a bright butterfly, a caterpillar crawling over a leaf that has fallen on the table, and a bird sitting on a pencil. If the butterfly is located on a glass vase, closer to the flowers, the bird, on the contrary, turned away from her, as if she did not care. She does not even care about the caterpillar, which can easily profit. Perhaps it is more attracted by the beauty of flowers, butterflies, caterpillars, which live in nature, and not in a stuffy room. And she looks to where space and real life.